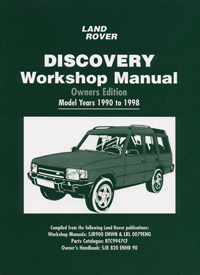 This workshop manual covers all basic models of the Land Rover Discovery Series I manufactured between 1989 and 1998. Both manual and automatic transmission versions are included. The material in this book has been specially selected by a Land Rover expert for the practical owner who enjoys carrying out basic maintenance and repairs on his or her own vehicle. The information here is taken directly from Land Rover's library of technical publications on this vehicle, which includes the workshop manuals SJR900 ENWN and LRL 0079ENG, parts catalogue RTC9947CF and the owner's handbook SJR 820 ENHB 90. The manual does not set out to cover every single job which may be necessary on a Discovery; many jobs require a high degree of mechanical expertise and/or special equipment which the average owner is unlikely to possess. However, descriptions of some complicated tasks are included here, as are diagnostic tables, to help the interested owner understand the work that may be necessary on his or her vehicle, even if that work will actually be done by professionals.